Artificial lawns are popular with homeowners for good reason. The low maintenance aspects, lower water bills and environmental impact make use quite popular. However, in the past two decades, artificial grass is popping up in very unusual spaces. Think of pop-up stores, festivals and large corporate events. Now think of how many times you have seen artificial grass as part of the design scheme. 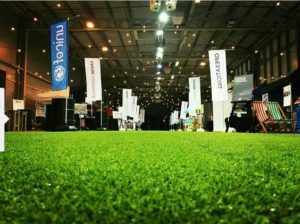 Seems like event production companies prefer artificial grass. It used to be event production companies had to work with what they had. That meant unsightly lawns, bare spots and muddy patches had to be addressed when event venues contained outdoor spaces. Well, that’s no longer the case. Artificial grass changed everything. Following are five reasons event production companies prefer artificial grass. This is huge if you are an event production company hosting a gathering for thousands of people. Harmful chemicals could end up on shoes which later end up on natural grass and in our waterways. Furthermore, little hands and feet could potentially come into direct contact with them. This could cause a rash, allergic reaction or worse. Particularly in areas affected by constant drought conditions, like our home state of California, artificial grass makes sense. Event production companies prefer artificial grass because they don’t have to water it during the event. This is a huge benefit because it not only saves water but ensures the grass is Evergreen. Think about it. If you don’t water grass during the event it will turn brown. That doesn’t present well. We already mentioned the way that artificial grass impacts water conservation and how it protects the environment. However, it also uses recycled materials for much of its construction. Therefore, this translates into much less waste for landfills. Using artificial grass is the eco-conscious choice. Therefore, event production companies love it. Also, artificial grass protects the environment by protecting existing areas. It can be used as a protective covering over regular grass or other areas. For instance, let’s say a hard rain comes during the event. Instead of a muddy field, which will track everywhere, artificial grass remains clean and mud free. This is probably why you see it used for large public celebrations, massive outdoor music festivals or major sporting events. It’s an easy way to protect existing grass and the environment for a few days from heavy foot traffic. Let’s be honest, when it comes to major events like the launch of a corporate business, a celebrity wedding or high-end photo shoot, background imagery is everything. It’s important to maintain a sense of continuity throughout the entire space. Artificial grass lends itself to this more so than traditional grass. For instance, artificial grass is unaffected by things like disease, weather or pests. As result,maintenance is so much easier. This creates peace of mind in the sense that the space will never change. It will always remain perfect. Also, it looks as good as natural grass. People love it! In addition, artificial grass installs rather quickly. This makes it a popular choice for creating instant drama and allows for greater landscape control. Rather than install sod and water for a few weeks, artificial grass installs in a matter of days. This transforms huge spaces quickly negating issues like weather or rooting. Seems like event production companies prefer artificial grass because it is versatile and easily adaptable. Natural grass, not so much. Artificial grass lends itself to so many different application styles. In other words, you don’t just have to install it on the ground. This makes it perfect for slopes, rolling hills and other types of landscape grades. You can even install artificial grass on wall surfaces. This lends a massive amount of creativity to event production companies. With a little bit of imagination it’s easy to create a stunning design. Those designs capture attention and generate buzz. Are we saying artificial grass could be a great source of indirect advertisement for your next event? Absolutely. This is why fashion shows and new tech launch companies use it during press ops. It’s a great conversation starter and creates a lively backdrop for images and video. Never underestimate the drama factor of artificial grass. This is why event production companies prefer artificial grass. One of the best features of artificial grass is its complete versatility. It installs anywhere. For instance, consider the Dreamforce conference. Every year, our products carpet the streets of San Francisco for several city blocks. Black pavement disappears replaced by lush, evergreen artificial grass. It’s a way to give people respite from the concrete jungle of city life. The same happens with Park Here in New York City. However, it doesn’t just stop there. Residential customers use it to. Many homeowners install artificial grass to surround swimming pools or create an outdoor screened in patio. You can even find NewGrass products in conference rooms and lobbies all across the United States. Event production companies prefer artificial grass because they can install it anywhere they choose to. Remember, somebody has to clean up after these wonderful events. And while trash collection and furniture/fixture removal are two that come to mind, consider events that use natural grass. Would you want to spend a couple of weeks removing sod or bringing trampled grass back to life? This is why event production companies use artificial grass. It’s extremely easy to uninstall, and the cleanup is minimal. Simply remove the grass and the space instantly reverts back to its original condition. It doesn’t get much easier than that! If you own an event production company or are curious about artificial grass as it relates to commercial projects, contact us today. 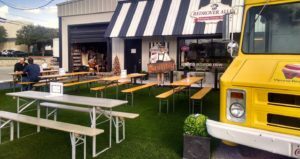 At NewGrass we are very familiar with commercial projects involving artificial grass design. Our team is ready to answer your questions and help you find a product that best suits your needs. We look forward to helping your event be the next big thing everybody talks about!